Michaelmas is upon us again. The unrelenting rain and accompanying darkness without bring the message of death forces home. We feel the darkness; we bend at its weight. Though we know, each year, that the challenge is to bring forth the counter-forces of light and will from within, we struggle. I began knitting my teenager a scarf late August, so that some warmth from my hands might accompany him when he travels without me . A few weeks ago, due to my inexpert thread calculation, I had to join ends to complete a row. This, of course, resulted in a knot where I didn’t want one. I didn’t have to. I could have redone the entire row, but I chose not to. I decided the tiny knot was a symbol of life–a hurdle we must all strive to surpass. So I kept it in. Then the dragon landed smack into my household, ripping open our peace. The teenage years aren’t meant to be peaceful anyway, I tell myself. I think of the knot I chose to keep in my son’s scarf and blame myself for being so cavalier, as if the nub of thread was a foretelling or, worse, a conscious creation of conflict: a beacon I crafted so that our dragon might find its perfect landing. And that is how Michaelmas made its entry into our home this year–through communication lines opened, offered, but rejected. It came through tears (mine), mostly unshed, which dug crevices in my mother soul. It came through adolescent hostility that clings with extreme tenacity. 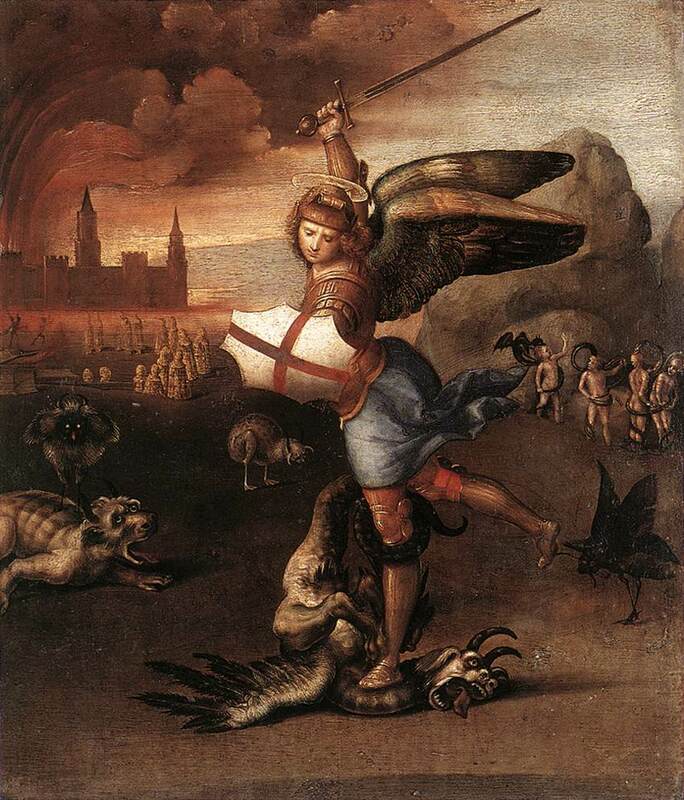 Michaelmas asks us to be courageous, to overcome nature and our animal forces so that we may be fully self-aware. So, I forcefully leave the realm of self-recrimination and pain, and stand on balanced ground that exists mostly in my longing. I will balance where I am most unsure. I will generosity of soul where I am mostly hurt and angry. I will myself to step in his adolescent shoes, even as my feet barely extend from the fetal position I have difficulty uncurling from. I step back rather than wallow. I endeavour to take a wider and longer view, even though I want to roll around in the details. I listen to the quietest voice in my heart, even if it leads to the most difficult path, as I have found that is what always carries me to true ground. I take the road of great discomfort because I have to overcome the desire to allow pettiness, pain and resentment to be my weapons. More and more I feel that it is in our community life the dragon rears its most fearsome head, whether it be the family unit, school, church and the larger one of country. It seems we are battered on all possible sides so that we can barely take a breath, plan, or strategize at leisure. There is no such thing. We must do everything simultaneously, wield our yet unforged sword because there is no time to waste. But it is during these times we can birth a new brand of inner courage, the kind that allows us to look at ourselves and ask where we might do and be better, how we were wrong (yes, we can be that), and how we might transform. It is a time to stop looking outward at how others have incurred our wrath because they were misinformed, incompetent, unworthy, or ignorant. They were wrong because we never are. Right? But to point at others is easy. To assign blame, too easy. To assume the dragon is outside, way too easy. The real work is looking within and seeing yourself for who you are, how you’ve behaved, whether you’ve contributed to truth or falsehood, to building or tearing down, how you did it, and then how you can steer the course towards a better path. It takes a different kind of courage and honest self-awareness. That is what the season calls for and we must be brave enough to answer. Michaelmas brings death forces; we see it in nature. For us, it is the end of summer and the beginning of rain, which often leads to literal death, destruction and loss. But such catastrophes make room for our own life forces to emerge. During these times, we can witness how that which is most human in us can burst forth with such will and heart. That is the challenge of the season anyway, whether or not external calamities of epic proportions help them come about. Around this time of year, something in our biography is awakened that is not easy nor peaceful. I always think I am ready for it, but each year I am still caught unaware. No matter how well you think you know yourself, or promise you’ll do things differently, your inner dragon will show you just how much work you need to do. It will reveal that in the past year you grew more thorns in your speech where you thought you were blossoming petals, or that you were leaving a trail of wounding shards where you thought you left not even a faint toe print. Anyone on a conscious path will experience this to some degree. The key for me has always been to face myself, hard and unpleasant as that always is, to stop looking outside at who did what, but so see where I can summon forces of courage and strength against my own demons. The goal is not to stab mindlessly at the things that ail us, to remove them so that life can be peaceful and normal again, because that is not the way of life. Its way is to push us forward with new strength, and the only way to earn that is to gather the will to look at ourselves with clear eyes because that is where all transformation must begin. Once we do the difficult work, trust that it will fall where it is most needed, supported anew by spiritual bones, muscle, sinew and blood made stronger by the effort. Dragons are there to wake us up to the strength in us that we have to constantly sharpen for everything that lies ahead. If we recognize this, we will find the courage to meet them with gratitude. I wish you all grace and strength this season. Thank you for this, Sarita. I am so glad you found comfort here. We are almost at Michaelmas again, so it is very timely. Blessings to you.